If you want to give your home the warm look of cedar siding but want the benefits of vinyl siding, then our shake siding is the perfect option for you. It’s meant to replicate the look of real cedar shake siding but will withstand Chicago’s weather better. It’ll stand the test of time. 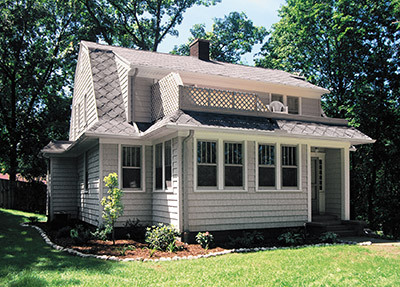 Our vinyl shake siding has a similar look to cedar shake siding. 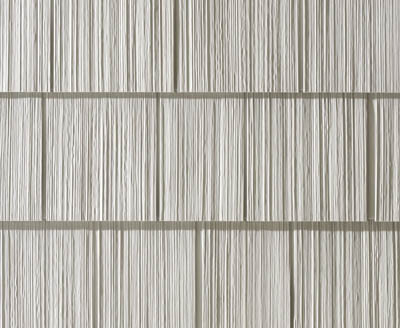 It has a wood grain finish that you won’t find with other vinyl siding styles. This gives your home a warm, comfortable look. If vinyl shake siding is made to look like cedar siding, then why not just choose the real wood? There are several reasons why vinyl is a better option – especially in Chicago. Our shake siding has foam insulation boards installed beneath the siding to prevent heat or air from escaping your home. This will make your home more comfortable and will save you money on your energy bills. Cedar siding is susceptible to rotting, warping, expanding and swelling especially when exposed to moisture. Chicago has humid summer and heavy precipitation each year. It’s impossible to avoid moisture. Vinyl on the other hand is resistant to warping, rotting, expanding and swelling. The boards aren’t affected by moisture and won’t start to fall apart after a few years. In order to keep your cedar shake siding looking good, you’ll need to paint and stain your siding every couple of years. Our vinyl shake siding has the colors infused into it when it’s made. You’ll never need to paint or stain the vinyl. It’ll look as beautiful as it did on installation day. Most Chicago homeowners use shake siding as a complement to other vinyl siding styles. Areas such as eaves and gables are common. Some people get a little more adventurous and side their entire home in Chicago with shake siding. The choice is yours how you want to use it!